Just paste the desktop link in. Further to my inability to operate websites; the same is happening with bay of E and it's definitely cramping my ability to browse for random shite. Is there a similar obvious-but-entirely-missed-by-me way of switching off the mobile version in favour of the fullfat one? I only use AS on a proper computer, so I'm no expert, but I think you need to take your landscape mode pictures with the Home button of your iphone on the right hand side. So the phone is swivelled to the left. 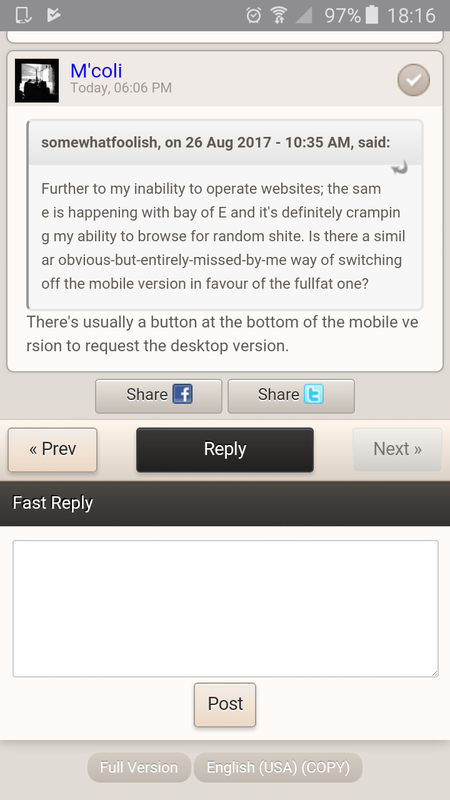 There's usually a button at the bottom of the mobile version to request the desktop version. A genuine catch 22! If I PM a mod my actual email address, could my information be updated by them? Hey never mind, I just tried again and it signed in fine with the same password I'd been trying for ages so no worries! I've not tech savvy so this may be a stupid question but it would be great if you could attach photos and videos as easily as say the whatsapp site. Is this asking too much of the forum software? Is there an answer to this. My other half took a load of pictures with her i phone and I have downloaded them to my laptop. They all appear the correct way up on my laptop, but if I go to put them on a post here it puts them sideways. I just open the picture in photo viewer, screen grab it and put the screen grab in the post. I've had a look at the various configuration options for the gallery plugin, and I can't see anything that would fix the rotation issue, but I'll dig deeper. I wonder if we had a 'calendar' tag (like for sale, wanted, lost/stolen etc) it would make it very easy to find the monthly autoshite calendar threads? Just tried this & it works. PITA though. Apple are supposed to be run by brilliant people. Geniuses even. At one time they even had their own deity. Yet none of these geniuses can write a line of code in iOS that can tag the images correctly depending upon the orientation of the device. Not one of the geniuses realised no-one wants upside-down photos as standard. Not one. The screen can display whatever orientation the phone/tablet is at, but they can't fix the camera problem after 7 minor revisions of the same device? It's moronic reasons like that (among many) that I give Apple a huge swerve. I think so, message me please (or post on here) and I'll try for you. I've noticed what are blatantly spammers trying to join up on here again in numbers recently. If anyone knows someone who wants to join up, could they private message with the person's required username and email address, please? It's only because I think one or two genuine people have been sacked off as spammers by (my) mistake, soz, a lot due to strange email addresses that don't seem legit. Let me know what you'd like to change it to and I can do it for you. I wonder I the news 24 thread could be pinned? Has that been considered before? What is the deal with the Thanks button? I've apparently been thanked 8 times, but I can't see by who or what for? I am a very shallow person and if there is validation, praise or acknowledgement going I'd like to know about it. I've seen such a feature on filesharing forums and such. Not much point here. Can I suggest a 'modern forum' button on the navigation bar at the top? It's normally so frequently updated that there is not really a need to pin it in my opinion. Can I just ask, when I post on my phone all the photos come at the end of my post. How do people manage to insert the photos at different points throughput their posts? You should have the option to click add to post for each uploaded picture and this allows it to be inserted wherever you want. Whenever I add photos on my phone they always go to the bottom of the post. How Do I change the title of a post I've made? Or cant this be done? If you mean change the title of a topic you need to edit your initial post and choose use full editor. Pictures, or partial lack of. I'm usually on here via Tapatalk on my Android phone. Recently it seems to be a lottery if I see a posted pic or not. It's not the file type as one post the Jpeg is fine and the next blank. I can only think it's to do with how they're posted. Any ideas? Issue sorted. My preferred network was set to LATE, changed to 4G and all is now revealed.